MOSCOW, December 6. /TASS/. /TASS/. 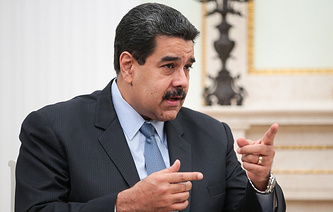 Venezuela will use Russia’s satellite navigation system GLONASS, Venezuelan President Nicolas Maduro said on Thursday. "The GLONASS satellite system developed in Russia goes to Venezuela," he said in an interview with Venezolana de Television commenting on the results of his working visit to Moscow. "It will help improve our country’s telecommunications possibilities," he said, adding that this is an "utterly new" cooperation area. Russia and Venezuela have joint project in the energy sector, in agriculture, in the prospecting sector, in pharmaceuticals, in the sphere of information and telecommunications technologies, in nuclear medicine, in the area of military technical cooperation and others.